The Colts will forever be associated with imposing quarterbacks tasked with calling their own plays, firing bullet passes across the field, and leading fourth quarter comebacks. Two of their alumni have already punched their tickets as two of the all time greats. In the future, Andrew Luck could also be hailed as an elite signal caller if he continues to develop, remains consistent, and puts up big numbers in big games. The Colts franchise, however, has remained somewhat fractured, owing to its history in Maryland and Indiana. On a snowy night in 1984, Colts owner Robert Irsay had a team of movers pack up Mayflower trucks and head west along I-70 to abandon Baltimore for Indianapolis. The greatest 5 Colts of all time, of course, embody the apex of the franchise in both places. John Mackey was arguably the greatest NFL tight end of all time, and would sometimes remain on the field for special teams spot duty as a kick returner. In nine years of service at tight end for the Baltimore Colts, Mackey hauled in 320 receptions for 5,126 yards, and 38 touchdowns. As a tight end, Mackey averaged 16 yards-per-catch. At 6-foot-2 and 244 pounds, he was too fast for linebackers to contain, and too physical for diminutive defensive backs to grapple with in space. Gino Marchetti has credited his time as a World War II soldier for ultimately solidifying the principles of his NFL career. While in the Army, Marchetti was drilled in the fundamentals of teamwork, perseverance, and leadership. 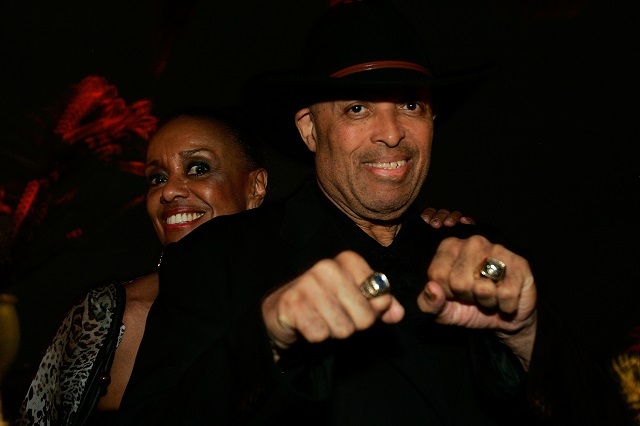 After returning home, he played college ball at the University of San Francisco, before being drafted into the NFL by the New York Yanks, which were to be rechristened as the Dallas Texans shortly thereafter. In 1953, many of the Texans players including Marchetti, were folded into the new Baltimore Colts. Gino Marchetti was relentless as a defensive lineman. As a tackle, he would often knife through the line of scrimmage to drop ball carriers for losses. In passing situations, he would rotate over to defensive end, where he would use a speed rush off the edge to harass the quarterback, and Packer great Forrest Gregg lauded Marchetti as his toughest matchup. Marvin Harrison was a technician at wide receiver. For Indianapolis, Harrison was especially adept at running option routes, reading defenses while staying on the same page with Peyton Manning. When attacking zone coverage, Harrison would break off his route early and work his way back to the quarterback. When working one-on-one against a corner, Manning and Harrison would often connect on a double move for six. This prolific duo was especially dangerous on the slant-and-go, where Manning would pump-fake the slant before airing out a deep bomb to Harrison. 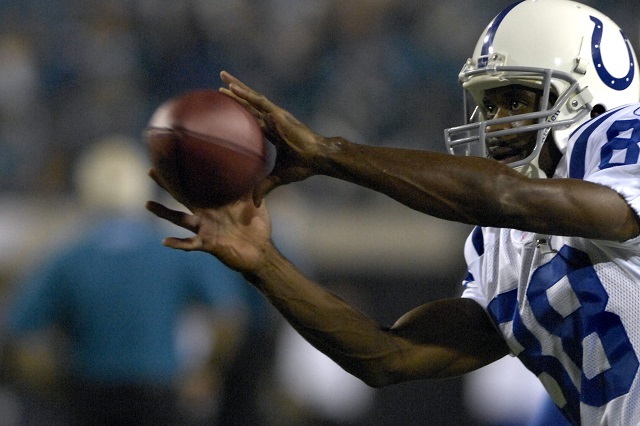 A model of consistency, Marvin Harrison put together a stretch of eight straight 1,000-yard seasons, between 1999 and 2006. In 2002, Harrison led the NFL in both catches (143) and receiving yards (1,722), in one of the more prolific individual seasons ever. For the sake of comparison, Harrison caught 31 more balls and racked up 375 more receiving yards than second-place finishers Hines Ward and Randy Moss, respectively. In all, Marvin Harrison made 1,102 career receptions, which is still good for third of all time, behind only Jerry Rice and Tony Gonzalez. It’s not much of an exaggeration to say that Peyton Manning almost immediately reinvented the Indianapolis Colts, turning them from a doormat into a perennial Super Bowl contender. 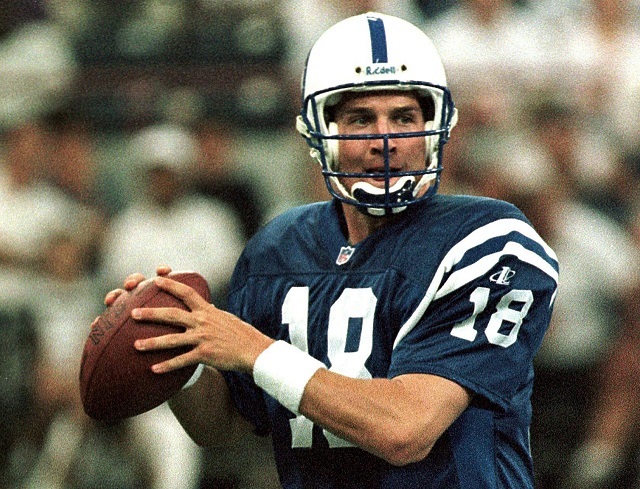 By Manning’s second year in the NFL, the Colts had finished out the 1999 regular season at 13-3, and were punching their tickets to the playoffs. From there, the franchise went on a remarkable run, making the postseason for 10 of the next 11 years. In 2006, Payton Manning finally won the Big One, making quick work of the Chicago Bears in Super Bowl XLI — a game that saw Manning take home Super Bowl MVP honors after throwing for 247 yards, 1 touchdown, and 1 interception, on 25 for 38 passing. For several years running, Manning versus Brady and the New England Patriots would more or less settle the AFC Championship, and by extension, the Super Bowl. Peyton put up staggering numbers in Indianapolis throwing for 54,828 passing yards and 399 touchdowns on a 65% completion rate. 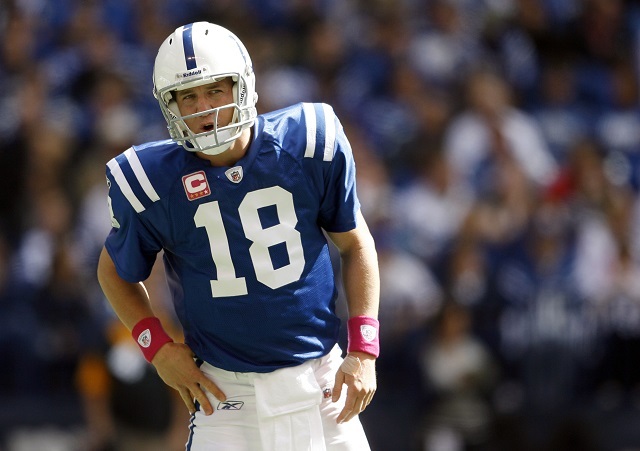 Manning threw for more than 3,500 yards and 25 touchdowns through each of the 13 full seasons he turned in for the Indianapolis Colts. 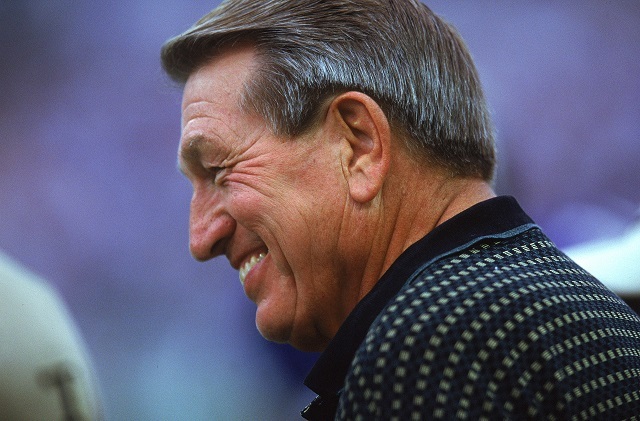 Johnny Unitas is often credited for ushering the game of football into the modern era. Johnny U., wearing a crew cut and high top shoes, called his own plays, fired bullet passes, and engineered two-minute drills amid furious fourth quarter comebacks. Johnny Unitas led the Baltimore Colts to two NFL Championships, and in Super Bowl V, Unitas connected on a twice tipped, 75-yard pass to John Mackey, before being knocked out of the game. From there, back-up quarterback Earl Morrall entered the game in the second quarter, to dispatch the Cowboys, 16-13. 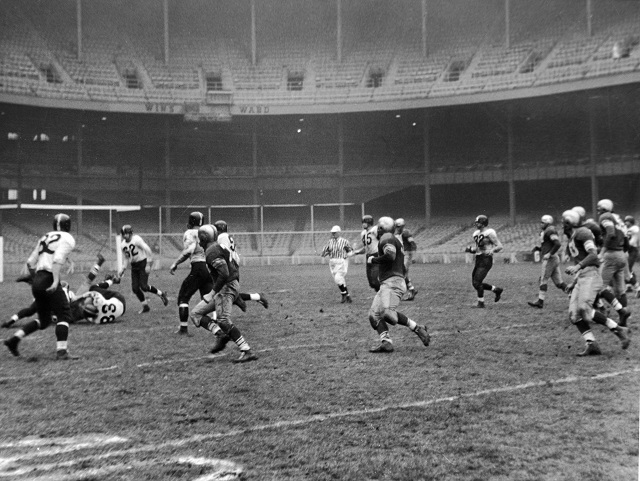 In the “Greatest Game Ever Played,” the quarterback rallied the Colts to a 23-17 victory over the New York Giants, in overtime, for the 1958 NFL Championship Game. Unitas went 26 for 40, for 349 yards, 1 touchdown, and 1 interception. In overtime, Johnny U. drove the length of the field, before handing off to Alan Ameche, for a one-yard dive into the end zone. In retrospect, this drama laid down the foundation for marrying the game of football to primetime television.